The heart of the city. ChicagoÃ¢â‚¬â„¢s Loop. This neighborhood is where it all happens and happens fast. Chances are, if you live in The Loop, you live in a high-rise. And if you live in a high-rise, moving, downsizing or de-cluttering can be twice as complicatedâ€¦until now. Zippy Shell can make mobile container storage in The Loop as easy as finding a taxi because Zippy Shell is the most convenient, affordable, mobile solution for self storage in Chicago! High-rise living definitely has itâ€™s benefits. No yard to maintain, indoor gyms and pools, 24 hour doormen and many other amenities. But when it comes to storage, sometimes a 5Ãƒ--5 cage on another floor just isnâ€™t enough. We offer more than enough space to store those things that just wonâ€™t fit in your unit at rates that you can afford. And, our street legal Zippy Shell will easily fit right into any loading dock, making it easier to drop off, pick up and take away! Chicagoâ€™s Easiest Portable Storage in The Loop! Using Zippy Shell is as easy as finding great theater in The Loop. Itâ€™s simple. We deliver. You load. We pick up and store. Itâ€™s that easy! And like all great theater artists, weâ€™re masters of improvisation. Only have a two or three hour move window? Donâ€™t worry, our driver will stick around. Know of some great street parking near your building? Let us handle the â€œNO PARKINGâ€ signs. Just like residents in The Loop, weâ€™re ready for anything! Containerized Moving is Now Available & Affordable! Once your belongings are ready to go, our driver will take them to our safe, secure, climate-controlled warehouse where theyâ€™ll be kept safe and sound until you need them back. Need a night or two of storage while youâ€™re waiting to close on your new unit? No problem. Need a few months of storage? We can help. No matter your needs, rest assured knowing that whenever youâ€™d like your stuff, just give us a call and weâ€™ll deliverâ€¦ right to your door or loading dock! The Most Affordable Self Storage in The Loopâ€¦and the Rest of Chicago! 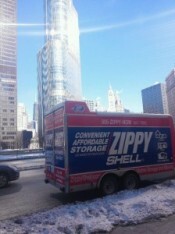 Zippy Shell is not only the most convenient mobile storage solution in Chicagoâ€™s Loop, itâ€™s also the most affordable! Just give us a call and find out. Weâ€™ve partnered up with many high-rises in the loop to offer special deals to residents, so be sure to check with your concierge or management company. Weâ€™re convinced we can give you the best deal and service in Chicago. Contact us now to find out!